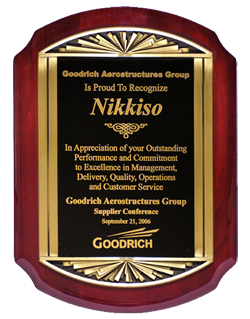 Nikkiso has vast experience optimizing quality, cost efficiencies, time to market and built-to-spec producibility for total reliability. 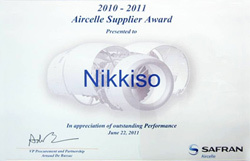 Advanced technology and analysis techniques With our advanced technology, time-tested throughout our more than 25 years in the aerospace industry, Nikkiso provides optimal production meeting the specification requirements that are unique to each client. Product and mold modeling are made using 3D CAD (computer-aided design) equipment, and shapes are tested using finite element method (FEM) analysis. We use the latest programs for design and analysis, including NASTRAN/PATRAN, FiberSIM, ENOVIA and CATIA. techniques Nikkiso has applied its superior molding techniques to introduce composite parts in more complicated shapes. Our original technology has made it possible to produce lighter components with complex designs while maintaining a high level of strength. Production facilities Technically superior, build-to-spec manufacturing is made possible with a brand-new plant in Vietnam outfitted with all the latest equipment and managed by Japanese leadership, as well as a state-of-the art facility in Shizuoka, Japan. Evaluation equipment Nikkiso has a wide range of evaluation and analysis equipment for testing composite materials, including strength testers (for static strength and fatigue), environmental testing devices (vibration and thermal cycle), and devices for non-destructive inspections. We also offer chemical analysis, and we design and evaluate testing devices for special-purpose products. 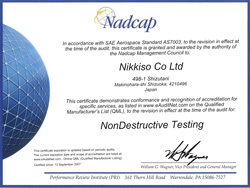 Quality control system Nikkiso has a thorough quality control system, backed by quality system approvals granted by major aircraft manufacturers, in addition to AS 9100 certification. Our highly advanced quality control system covers the entire process from the design stage, through material receipt, to product delivery. We also have advanced product testing equipment, including ultrasonic inspection equipment (A- and C-scans), gantry 3D measuring devices, and CMM. As well, we have received NADCAP (Composite and NDT) and ISO 14000 certifications, and Boeing D1-4426 certifications. 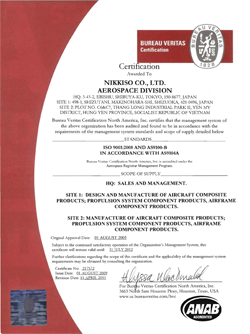 Lowest cost and highest value As the number one composite supplier in Vietnam, Nikkiso provides among the highest value available with a state-of-the-art facility that leverages reduced labor costs in this low-cost country’s dollar-based economy. Because Nikkiso has been manufacturing complex medical equipment in Vietnam for more than 10 years, we already have a proven track record of success. Work packages Through our plant in Vietnam, Nikkiso offers work packages allowing for job creation in this low-cost country.